As you know, I’m always on the look out for good authentic Malaysian cuisine. My recent foray with the Malaysia Kitchen Blogger Summit competition helped me in discovering a few more gems in the Melbourne area. 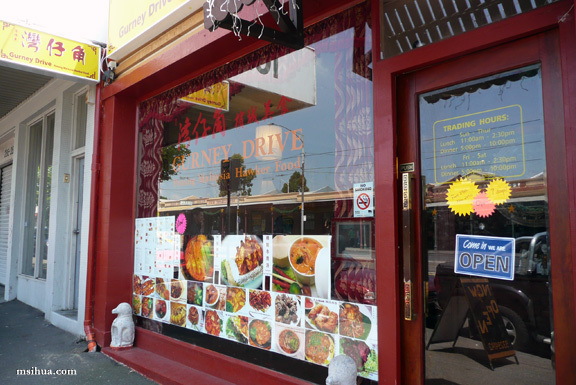 One of my favourite Malaysian restaurants which I didn’t manage to cover in my list is Gurney Drive located a stone’s throw away from the Queen Victoria Market in North Melbourne. 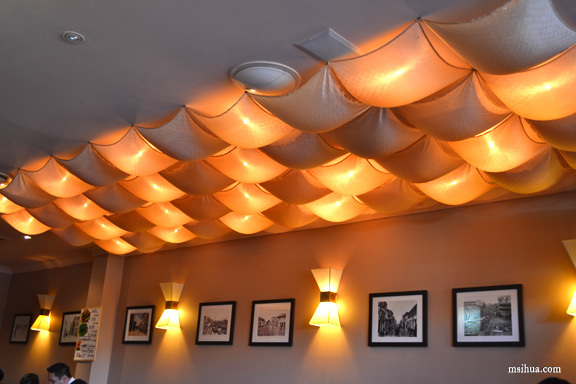 Aptly named after one of the most famous eating areas in Penang, Gurney Drive surprises with its wide ranging menu. However, my focus whenever I visit Gurney Drive is on their Malaysian Penang Hawker food list. They make one of the most authentic Char Kway Teow in Melbourne! 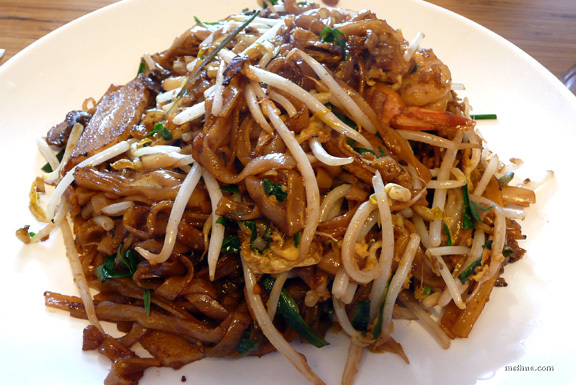 It is extremely hard to find good Char Kway Teow in this garden state of Victoria. 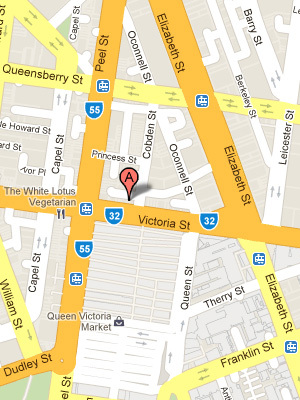 The old Little King Eatery on King Street used to have the best Char Kway Teow in Melbourne, but sadly it closed down. It has oomph, it has depth, but most of all, it has wok hei (Wok heat), a most critical element when one is eating Char Kway Teow. My other favourite dish to have at Gurney Drive is the Lou Shi Fan (Tear Drop Rice Noodles in Claypot) ($9.80). It always brings me back home when I have this dish. Occasionally it can be a little oily, but the flavours are still too good to bother with the oil. Note the sambal in the background of the picture. That goes amazingly well with this dish. SMASHING!! ME HULK! ME LIKE!!! YUM!!! 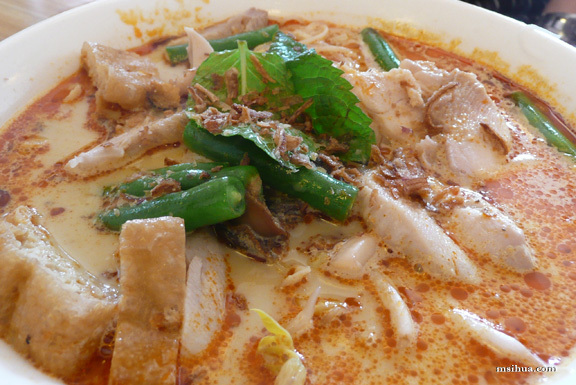 On another occasion, we visited Gurney Drive with cousin A, and he ordered the Penang Curry Laksa ($9.50). I had a sip of the soup, and it tasted pretty okay. Not the best laksa, but decent nonetheless. 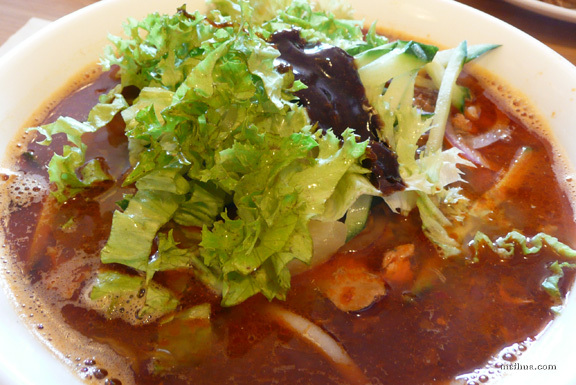 I however had a most disappointing Penang Assam Laksa ($9.80). Sadly, my journey to discover a good bowl of Assam Laksa in Melbourne continues on. Other than Chef Lagenda, there really is not much hope for this dish *sigh*. One could always fly to Malaysia for a good bowl, but that’s way too much effort! For one reason or another, the Boy always orders either the Maggie Mee Goreng ($9.00) or the Mamak Mee Goreng when he dines out at Malaysian eateries. Unfortunately for him, the ones he had at Gurney Drive turned out to be a tad too soggy. Poor Boy 🙁 . But he still orders them (each time!) whenever we visit. He said it tasted pretty okay with the exception of the chicken chunks (which lacks taste/marinade) in the dish. With a wide array of menu options, it’s not hard to find some hits and misses with the offerings. However, that being said, I will still go back with the intention of trying out the items on the rest of the menu, but I might not be able to resist the call of the Char Kuey Teow and the Lou Shi Fun!! First time I had the CKT there, it was very good! Red, light, spicy and charred. Few weeks later the same dish came out darker, wetter and sweeter, like Sg CKT. And please tell me once you find good assam laksa. Maybe we should ownself make!! I is so happy you is back, because even if we’re still in different cities, it makes my heart soar to know I can text you whenever if I want. Angle Babe lady, I heart you! Yayy! I need to try and find the recipe and make my own!!! North melbourne is like the hawker food place now! Don’t you think? It is getting to be that way isn’t it? Been meaning to visit. Hopefully, I can still make it there before I leave. But then I am heading back to Singapore. It’s delicious isn’t it? Sigh… I feel like I should go there now.. but sooo far right now! I really must go visit this place! 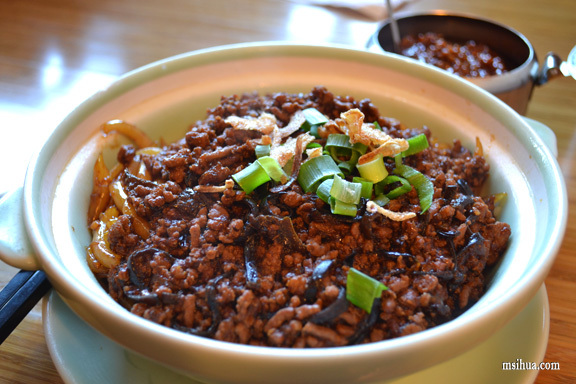 The CKT looks so yummy. I’m like your boy… I like to order mamak mee goreng at Malaysian places. It’s one of my favourite noodles! 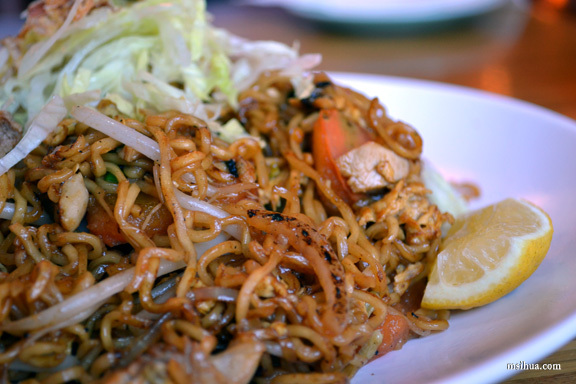 If you haven’t already tried it, I think the mee goreng from Rich Maha on Little Collins St is pretty good. Yup!! Oh my… I shall let the Boy know abou the Rich Maha… we usually go to the one at Vermont… Wanna catch up for lunch soon? That Lou Shi Fan looks great! 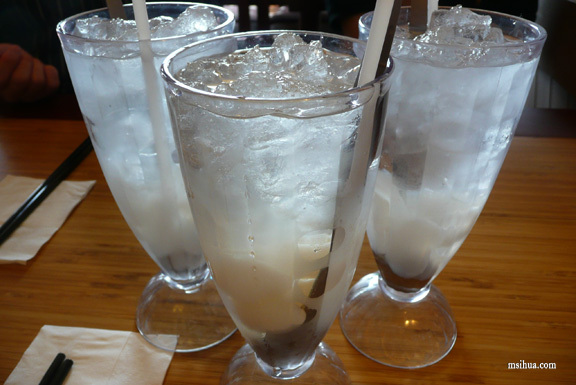 I freakin LOVE coconut juice!! I <3 Lou Shi Fun!!! Ooooh baby, that looks so good! I’ve been asking around for quality Malaysian places, and keep hearing that it’s really hard to find them. That char kway teow looks super good. Ugh I wish I wasn’t reading this so late… I’m hungry!